1. I can’t wear boots every day. Boots are my favourite type of footwear and I miss them in the warmer months. Especially the months that aren’t quite warm enough for flipflops (my second favourite footwear) but too warm for boots. 2. Baths aren’t really as good in warmer weather. In winter I have been known to have a bath every day (this isn’t to say I don’t wash otherwise, more that in addition to a shower) as a way to warm me up after getting back from work. Plus baths are so relaxing, if I ever need a bit of time alone and to chill out, then a bath is the answer. 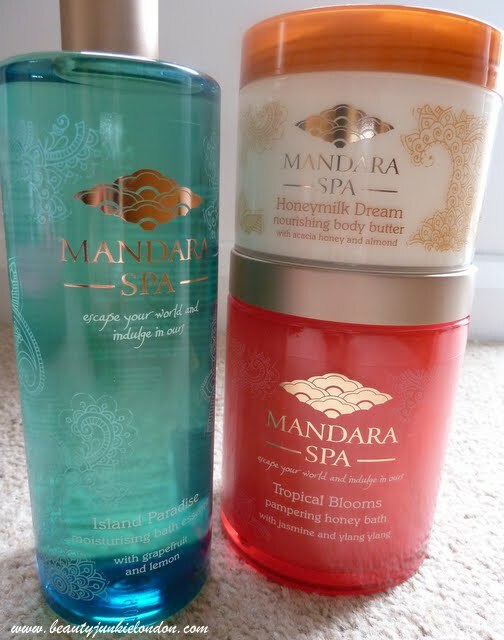 But with winter fading to a cold and grey memory, baths become less frequent – which is a shame as I have just discovered the lovely bathing products from Mandara Spa. Mandara Spa is a range of budget-friendly product (due to be available in Sainsburys) from the Elemis family. So if the steeper prices from Elemis make you think twice, then keep and eye out on the supermarket trip for these less wallet-emptying pampering treats. Of the image above I have been using the turquoise ‘Island Paradise’ bath foam and the ‘Tropical Blooms’ pampering honey bath (the red pot). The Island Paradise bath foam is my favourite of the two as it is easier/less messy to use and the bubbles last longer. The smell of this one is a lot fresher than the ‘Tropical Blooms’ one – with grapefruit and lemon giving it a citrussy fresh feeling. Although the honey bath definitely feels like more of a treat, I found that I poured a lot of product in and it made quite a mess attempting to pout under the running water from the pot – plus the bubbles didn’t last as long. But on the plus side, it smells AMAZING and the scent really lingered on the skin. I’ve only used the ‘Honeymilk Dream’ body butter once so far (not sure why I haven’t reached for it more?!) and it too smells divine. This feels very pampering, the texture – although described as a body butter – feels lighter, almost souffle like? Soaks in really nicely and keeps skin soft – I like how the slightly lighter texture feels a bit more Spring-like than the body butters for winter months. This is the first time in ages, that i have been able to use a pampering range of products. I am torn between ( Amber heaven ) sensual and musky and ( tropical blooms ) floral with a hint of mandarin. However, i tried the honey body butter and found it unsuitable, as it contains beeswax, which causes my skin to itch. I just hope ( unlike Champneys ) that the manufacturer does not change the formulas.